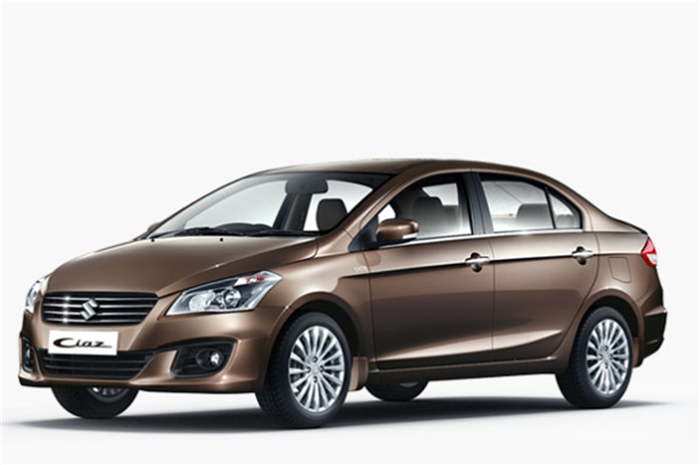 Launch of the Maruti Ciaz is expected sometime in the first half of October. For now, we have managed to get details about the features that every variant is going to get. The Maruti Ciaz is powered by Ertiga's 91bhp 1.4-litre petrol engine and 89bhp 1.3-litre Fiat-sourced diesel engine. The petrol motor comes with a five-speed manual or a four-speed automatic gearbox, while the diesel variant gets only a five-speed manual gearbox. The Ciaz comes in four trims each for the petrol and diesel models. The petrol Ciaz will be available in VXi, VXi+, ZXi and ZXi+ trims and the diesel in VDi, VDi+, ZDi and ZDi+ trims. The optional four-speed automatic gearbox will be available on the VXi+ and ZXi trims. The base VXi and VDi variants get features like projector headlamps, front and rear armrests, keyless entry, audio system with USB, aux-in and card reader, fabric upholstery, and electrically-adjustable wing mirrors with indicators, among others. Over and above this, the VXi+ and VDi+ variants get an airbag for the driver, ABS with EBD, climate control, parking sensors, Bluetooth for the audio system, height adjustability for the driver’s seat, and steering-mounted controls. The ZXi and ZDi variants additionally get 15-inch alloys, rear sunshade, keyless entry and go, front passenger airbag, electric wing mirrors, reversing camera, and fabric and leather upholstery. The top-of-the-line ZXi+ and ZDi+ variants get added features like the Smartplay infotainment system, leather upholstery, leather-wrapped steering and 16-inch alloys. When launched, the Ciaz will go up against segment rivals like the Honda City, Hyundai Verna, Skoda Rapid and the Volkswagen Vento.